Whew it has been a busy summer. This week, building on the momentum of our last big release, we have pushed out the following great upgrades! 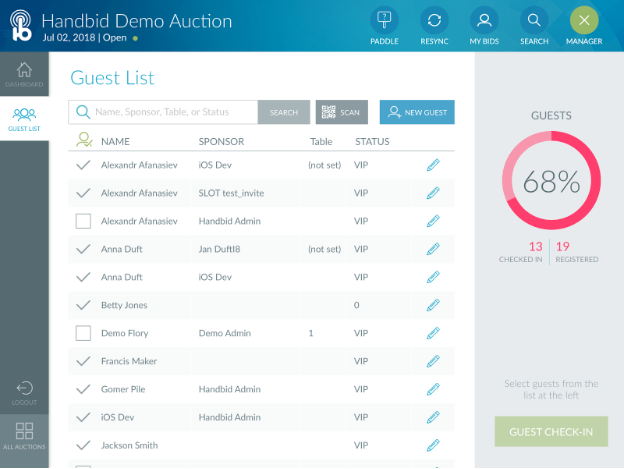 Handbid for iPad gets a new Manager section and Guest List Manager! This is our biggest upgrade to our iPad kiosk app ever. We have added a new manager section to the iPad where managers can view real-time statistics on their auction. Watch the dials turn and the data update each time a bid comes in. Go on, try it - you will get hooked watching this screen during your event! From the dashboard, you can now enter a new Guest List Manager. This links up directly with the guest list in the auction manager and allows your registration team to add guests, look up guests, check in guests and even SCAN guests in to the event. Yes that is right, managers can now register and check in guests all from the iPad. Add guests to the guest list and scan QR codes to check-in guests when they arrive. For more information or to watch a live video demonstration of the guest list feature, you can view this help desk article here. Ok, not nearly as exciting but very important are additional security and privacy updates we have put into Handbid for all users in this last release. All of these changes are meant to make the system more secure and to protect the data and privacy for all users. Most users will not notice the changes. Some may be asked to login again. Either way, we are always focused on implementing the latest security best practices. This goes without saying, but we want to urge all of our users to make sure they are running the latest version of our apps. If any of your users are having issues with their accounts authenticating, please make sure they are running the latest version from the AppStore or Play Store. On the privacy front, we now allow all users to manage their user information directly from their profile on the web (at events.handbid.com). 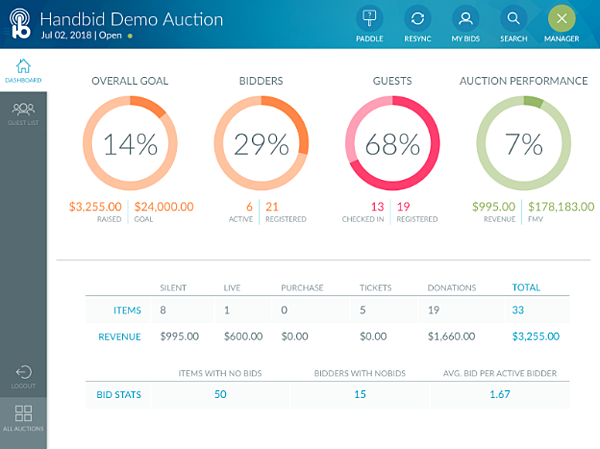 Here we have added a new “My Data” section which shows each bidder the list of organizations and auctions which have access to their information. From this screen, users can remove themselves from any organization or auction or remove their account entirely. We hope you find these new updates helpful! Get that latest iPad app downloaded today and check it out. We still have a lot of great new features to release, so expect to hear from us again soon!